Be assured that with Blue Heeler Bins, you will receive services tailored exactly to what you ordered. If you order a 4 cubic meter bin, you are getting a 4 cubic meter bin, not 3 or 3.5. That’s our guarantee. Do you ever find yourself with a large amount of rubbish or waste to handle? Do you need to hire a skip bin, or would you rather have experts take care of it instead? Look no further, because all of your rubbish removal and skip bin hire needs can be met right here. - We are an Australian, locally-owned company that has more than 20 years of experience in the field. We have the experience, expertise, skill and the resources to handle all types and scales of residential, commercial, industrial, deceased estates, yard cleanups & recyclables jobs. Our staff members are well-trained and professional, and will look after your rubbish removal or bin hiring needs with a great degree of efficiency and in a punctual and friendly manner, no matter the size or nature of your requirements. We are the Skip Bin Hire in Sydney experts who believe that Rubbish Removal does not have to cause chaos in your life and have a simple goal- To provide you skip bins and rubbish removal solutions that are efficient, simple, personalized and cost-effective. We are here to handle all your waste removal needs and provide the best and the most inexpensive services. Our customers are stress-free when they know we are handling the work for them. Your experience with Blue Heeler Bins’ professional services will leave you with no mess, no stress and no fuss. Furthermore, we at Blue Heeler Bins provide our customer-centred, satisfaction guaranteed services to a wide range of locations in Sydney. For a full list of the areas to which we provide rubbish removal, go to the Service Area section of our website. When you contact us, all you have to do is tell us exactly what your requirement is and our experts will provide you the best solutions. If required, we can advice you about the kind of bins that will match your needs and your budget. If you have a large-scale waste removal project that you want us to handle, you will want to know in what size-combination it is best to use these bins. We will tell you exactly which combination will work out to be cost-effective for you and you can end up saving a significant amount of money. Having rubbish removed or hiring a bin can be a stressful experience for some, especially if you have a large amount of rubbish to remove and little space to fit a bin. 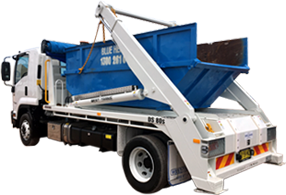 However, Blue Heeler Bins also hires out crane bins to those customers looking for a stress-free experience. Crane bins allow for easier bin placement in a far greater variety of spaces, and with the wide range of offered bin sizes we can take care of your bin hiring and rubbish removal needs, no matter your circumstances. We provide a large range of bin types and bin sizes, with skip bins and crane bins available in sizes that can be used for jobs both small and large. No job is too big or too small for us, and so our bins come in sizes suited to either. We absolutely guarantee that the bin sizes you receive will not only be tailored to your needs, but be exactly what you ordered, a guarantee that may not be provided by other skip bin hiring and rubbish removal services. A wide range of bin sizes. Crane bins for easy access. It’s never been easier to find the best Skip Bin Hire in Sydney. We simplify our services for you, excel in our job and are the problem-solvers when it comes to waste removal. Don’t settle for mediocrity, when excellence is only a phone call away. Simply call Blue Heeler Bins on 1300 261 041 or contact us via this online form. You can even find out more by keeping up with our blog to hear the latest news and learn more about what we can provide . Simply head to the ‘Blog’ section of our website for more details. If you order a 4 cubic meter bin, you are getting a 4 cubic meter bin, not 3 or 3.5. That's our guarantee. Do you ever find yourself with a large amount of rubbish or waste to handle? Do you need to hire a skip bin, or would you rather have experts take care of it instead? Look no further, because all of your rubbish removal & skip bin hire needs can be met right here. Your experience with Blue Heeler Bins' professional services will leave you with no mess, no stress and no fuss. 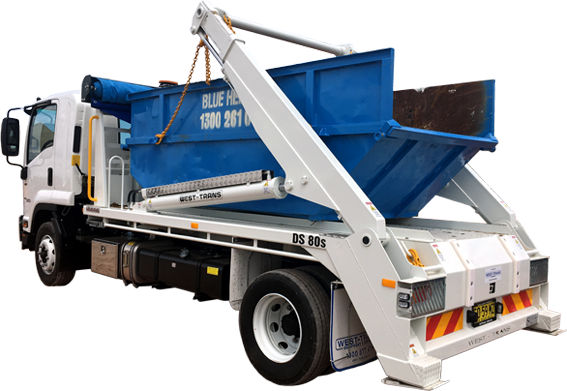 We at Blue Heeler Bins provide our customer-centred, satisfaction guaranteed services to a wide range of locations in Sydney. For a full list of the areas to which we provide rubbish removal, go to the Service Area section of our website. When you contact us, all you have to do is tell us exactly what your requirement is and our experts will provide you with the best solutions. If required, we can advise you on the kind of bins that will match your needs and your budget. If you have a large-scale waste removal project that you want us to handle, you will want to know what size-combination it is best to use these bins. We will tell you exactly which combination will work out to be cost-effective for you and you can end up saving a significant amount of money. We provide a large range of bin types and bin sizes, with skip bins and crane bins available in sizes that can be used for jobs both small and large. No job is too big or too small for us, and so our bins come in sizes suited to either. We absolutely guarantee that the bin sizes you receive will not only be tailored to your needs but be exactly what you ordered, a guarantee that may not be provided by other skip bin hiring and rubbish removal services. It’s never been easier to find the best Skip Bin Hire in Sydney. We simplify our services for you, excel in our job and are the problem-solvers when it comes to waste removal. Don’t settle for mediocrity, when excellence is only a phone call away. Simply call Blue Heeler Bins on 1300 261 041 or contact us via this online form. You can even find out more by keeping up with our blog to hear the latest news and learn more about what we can provide. Simply head to the ‘Blog’ section of our website for more details.